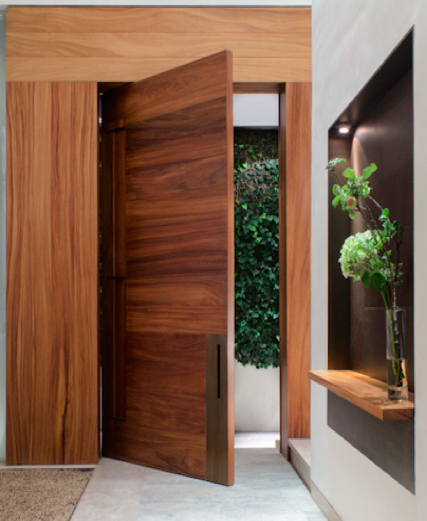 Hello , I am thinking of building a modern pivot entry door, similar to the photo listed, I was wondering if anyone could provide me leads, as to were to purchase these planks. My first time on this forum, any help would be greatly appreciated. Anything other than veneer would be insane for this project. Keith is correct. Things are not always what they seem. A solid core veneered door on pivots is a challenge for experienced shops. As for your request for planks, if built, how will the wood movement inherent in solid wood be accommodated? If you do not already know that a door like this must be veneered, your best bet would be to involve a qualified professional whom has the required knowledge and skills to build a door like this properly. I 3rd, 4th etc. all the comments about building such a door out of planks. Don't! Veneer is the only way to go for that look. That is if you don't mind making it many times.